Starborn Industries, Inc., a leading manufacturer of premium deck fasteners, has just announced a new line of DECKFAST Deck Screws for Metal Framing. This product was designed to satisfy the demand created by the increased usage of steel and aluminum deck framing in the deck market. DECKFAST Deck Screws for Metal Framing are versatile fasteners that attach 5/4 PVC, composite, capstock, and hardwood steel or aluminum deck framing systems. This unique screw features a drill point with wings, which increases speed and effectiveness of installation, prevents mushrooming on the deck surface, and insures that pre-drilling is not required for most decking materials, including hardwoods. Featuring triple strength corrosion protection, the DECKFAST Deck Screws for Metal Framing are made of 410 stainless steel with both a zinc plate and epoxy coating, which adds the extra protection needed when driving into metal framing. DECKFAST Deck Screws for Metal Framing are approved for use with Trex Elevations steel deck framing, Wahoo Decks DryJoist, and Wahoo DryJoistEZ metal substructure systems. 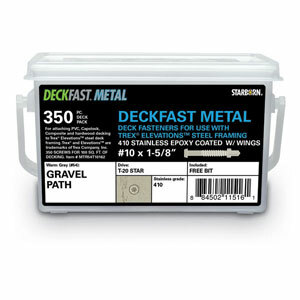 DECKFAST Deck Screws for Metal Framing has been tested with steel ranging from 18-12 gauge, (2) 14 gauge joists doubled up and aluminum from 1/8”-1/4”.